Sweden's Prime Minister Stefan Lofven has begun the final day of the general election campaign by warning about extremism and fascism. Neither his centre-left Social Democrats nor the main centre-right party is likely to win a majority. 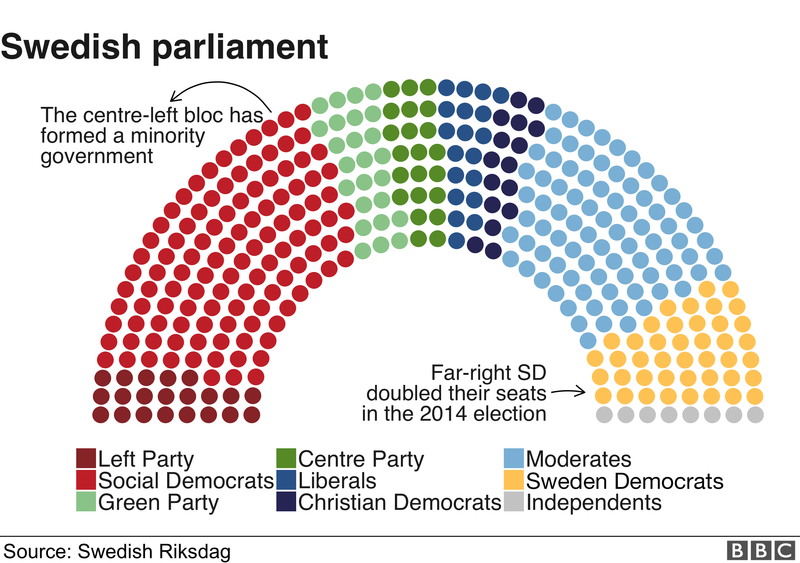 The anti-immigration Sweden Democrats (SD) is expected to win around 20% of the vote, becoming the second biggest party in parliament. Mr Lofven said an SD vote was "dangerous" and "counterproductive". He said it was "like trying to quench fire with alcohol", according to the Omni news site. Immigration has been a central issue of the election campaigns. The nationalist SD doubled its seats in the 2014 election and it is predicted to double them again on Sunday. On Saturday, SD leader Jimmie Akesson said Sweden had been "an extreme country in many ways, not least when it comes to immigration" and that his plan to take in fewer migrants would be regarded as "normal politics in the rest of Europe".
. . . Prime Minister Lofven currently heads a minority, centre-left coalition government made up of his Social Democrats and the Green Party. 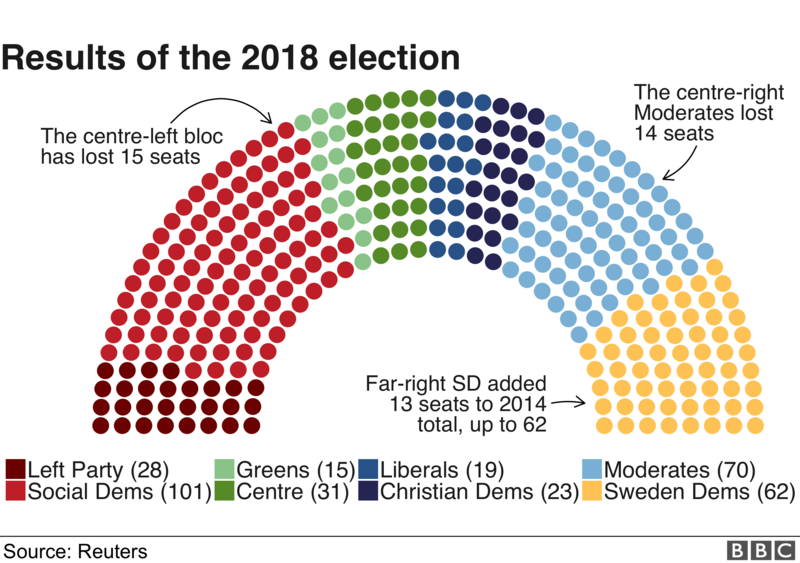 Sweden's nationalist anti-immigration party has made gains in the country's general election as the establishment parties appear deadlocked, exit polls predict. 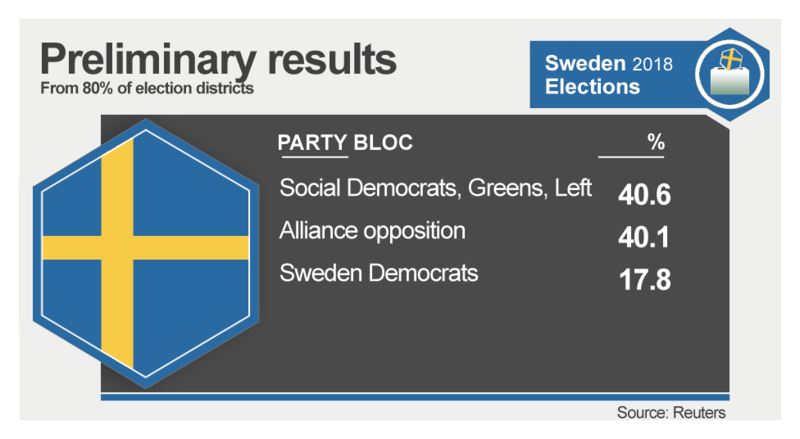 The Sweden Democrats (SD) are expected to achieve 19.2% of the vote. The party, described by Prime Minister Stefan Lofven as "racist", held 12.9% of the ballot in the previous election. Neither the governing Social Democrats nor the centre-right bloc of parties are predicted to win a majority. Immigration has been a central issue of the campaign. Mr Lofven has accused the SD of extremism and said that a vote for it was "dangerous". The outgoing prime minister heads a minority coalition government made up of his Social Democrats and the Green Party. Reacting to the exit polls, Peter Lundgren, an SD member of the European Parliament, told the BBC: "They can no longer ignore us. They will have to let us in in the discussions about how to form a new government in Sweden." Is this a good turnout? I'm not sure how parliamentary politics work. This is what tends to happen with a proportional voting system where the number of each party's seats in the parliament roughly corresponds to their % shares of the overall national vote (under a proportional sytem, Clinton would probably have beaten Trump). If a single party does not dominate enough then it has to form a coalition with one or more other parties, working out a compromise agreement for policies to push through. "With 99% of votes counted, neither of the leading alliances has reached the threshold of 175 seats, which is needed to govern. Mr Lofven's bloc holds 144 seats and the Alliance holds one less. Overseas votes have not yet been counted and so final results are not expected until Wednesday. Lengthy negotiations will follow to attempt to form a workable government. One option could be for one of the parties to switch alliances." The Center Right moderates should probably form an alliance with the SD's to make sure that they don't loose anymore seats. I don't understand why any Swede would vote for anything besides SD's at the moment, TBH. I'am disapoint by the result. @Jehan I wrote: I'am disapoint by the result. There is some reason to believe that the election was tampered with. And apparently, the votes aren't anonymous!